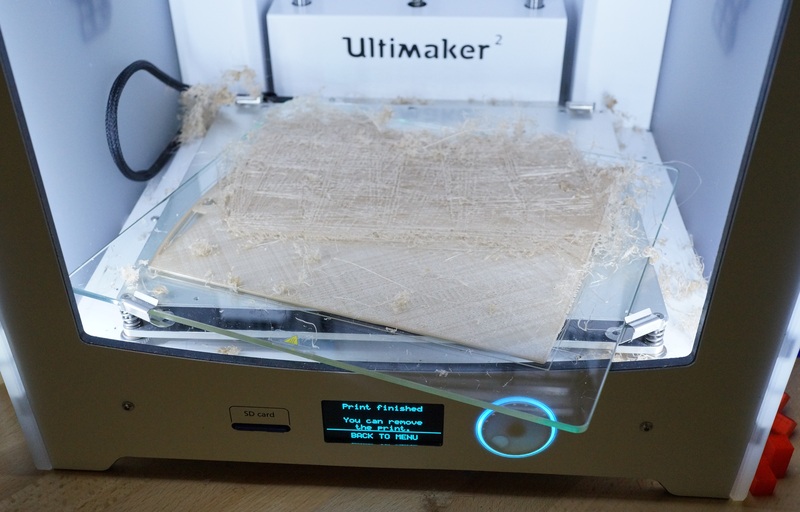 The Ultimaker manual recommends applying a thin layer of glue to the buildplate before starting a print. And yes, glue can help your print stick to the buildplate better, and it can be used to compensate for minor buildplate leveling issues that can’t be corrected in any other way. That part was printed directly onto the glass buildplate, and despite the very small contact area it stuck to the buildplate for the duration of the print. If you’ve leveled your buildplate properly, you should have no problems printing small and medium-sized parts directly on the glass. For larger prints that make contact with large swaths of the buildplate, a small amount of glue can be useful in dealing with any minor adhesion issues that you encounter. I recommend printing the first few layers, then checking to see if there are any spots where the filament has come unstuck from the buildplate, and canceling the print, applying a small amount of glue just to the problem areas, and then restarting (or if you check and find no problem areas, just let the print run with no glue at all!). If you see a large number of problem areas when starting a larger print, it’s better to relevel your buildplate than it is to try and solve the problem by covering the entire thing in glue. When leveling the buildplate, the wizard will point out the two front screws that you can turn to fine-tune your level. What it won’t tell you is that there’s actually a third screw you can adjust, as well. This screw is located underneath the build plate and towards the back (and in the center). This screw adjusts the rear-center height, and can be very useful if you’ve just reassembled your printhead and now find that you can’t level things properly because one notch of height adjustment (through the printer’s wizard interface) moves from ‘a bit too low’ to ‘a bit too high’. By turning the third screw, you can dial in the middle ground between ‘a bit too low’ and ‘a bit too high’ and get your buildplate leveled correctly. Oh, and since it’s not immediately obvious what affect adjusting the screws has, tightening a buildplate screw will lower the glass plate and increase the distance between the nozzle and the glass. Loosening will have the opposite effect. The wizard that walks you through the buildplate leveling process is helpful; but only until your first successful leveling attempt. The problem is that the wizard will tell you to adjust the buildplate screws in order to level it out. But if you’ve already done this (and confirmed the result) then your buildplate is level and playing with the screws will only make it worse! Once you’ve successfully leveled your buildplate the first time, it’s not going to drift out of level and the only thing you should ever need to adjust again is its offset height relative to the printhead. That’s the first and the fourth step in the leveling wizard and something you’ll want to do if/when you disassemble and reassemble your printhead, as the nozzle height is likely to change slightly when you do so. So if your buildplate is already level, and you need to adjust the height using the leveling wizard, the only thing you want to worry about is step 1 (or step 4). The other steps you should just click through without touching anything. If you find you need to adjust the third screw in order to dial in the correct height, you should also adjust the other two screws by exactly the same amount to ensure that everything stays nice and level. And in terms of getting to your first successful level, the wizard’s suggestion of using a piece of paper will get you pretty close. But the best way I’ve found to fine-tune things further is to start printing a large object and adjust the buildplate screws as the first layer is printing. If you notice that the first layer seems too thin in some areas, then you’ll want to tighten the nearest buildplate screw to lower the glass a bit. And if you notice that parts of the first layer are too thick and/or not sticking to the buildplate, then you should loosen the nearest buildplate screw to raise the glass in that area. When printing residue can build up in the nozzle, resulting in underextrusion and clogs if left unchecked. And residue buildup can be difficult or impossible to actually see, as even if the nozzle itself seems clear there can still be enough residue stuck around the sides to cause problems with a print. This can complicate troubleshooting, as a number of other issues can cause the same sort of problems with a print making it all too easy to blame a different component for a problem that’s actually being caused by a dirty nozzle. Once you’ve gotten used to it, it should only take a few minutes to step through the cleaning process, and you’ll have ruled out a common but hard-to-spot cause of printing issues. 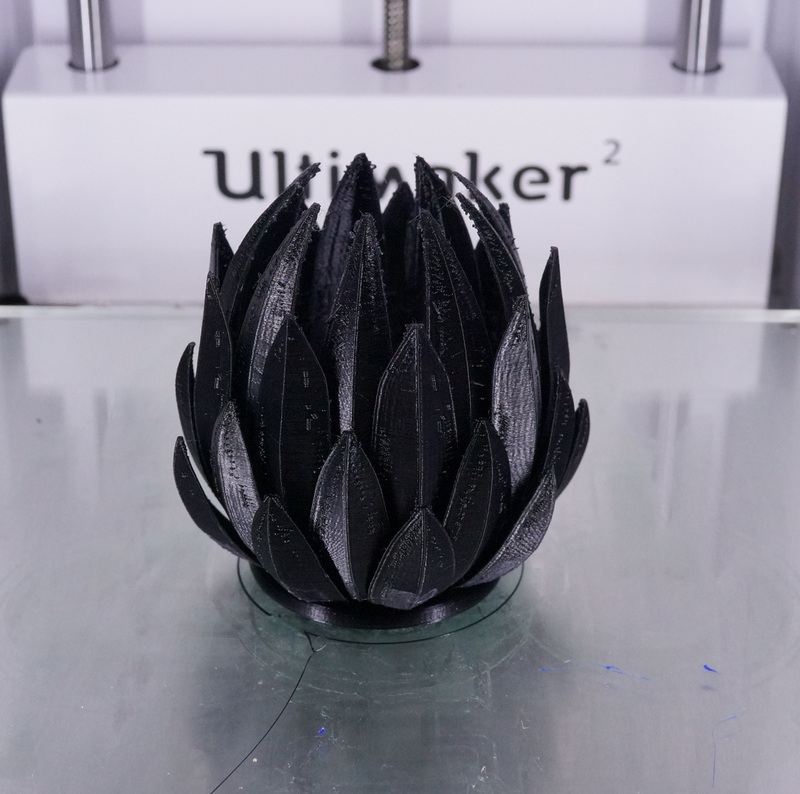 …good enough for printing better parts for your Ultimaker. With that setup, I get better prints, easier maintenance/troubleshooting, and more flexibility than what’s offered by the Ultimaker 2’s stock hardware. If you get a printer like the Ultimaker 2, one of the first things to do with it is print out some better replacement parts for it. And whenever printing replacement parts out of plastic, always keep a second copy on hand in case the first one breaks, or has a run-in with the hot nozzle and melts, or whatever. Having a spare always available is worth the few hours that it takes to print. There’s a test print you can do to measure your printer’s extrusion rate. Despite much of the discussion surrounding the subject, however, there’s a lots more to getting a good print than optimizing the extrusion rate. With the right parts, it’s actually fairly easy to get a successful extrusion-rate test. You can just dial down the tension on the feeder to the point where it will never skip backwards, and blow through perfect print after perfect print of the extrusion test. And then try to print an actual object that requires some retraction, and watch how fast your printer sands down the filament and jams. What I’ve found is that better results can be achieved by tuning the printer to the speed you’ll actually be printing at. The extrusion test goes up to 10mm3/sec, but unless you’re printing very low-quality, high-speed parts then you’re not going to come close to that extrusion rate in practice. 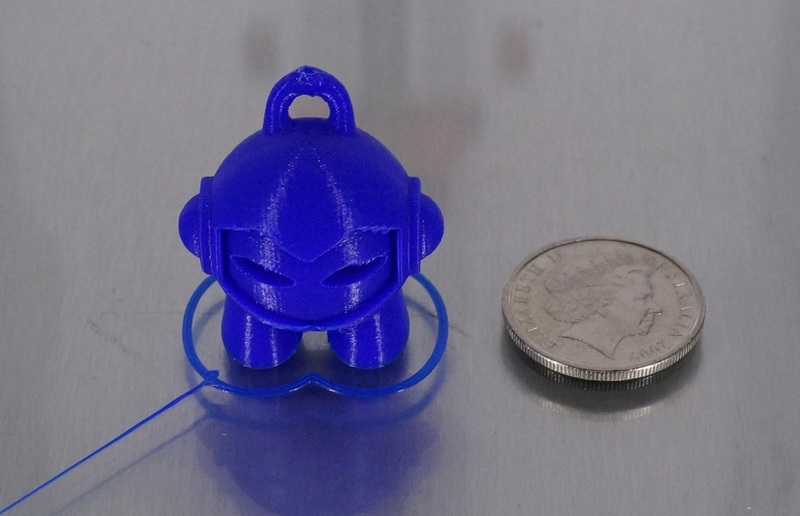 I personally never print above about 5-6mm3/sec, and find that I get the best results by increasing the feeder tension until the extrusion test fails around the 7-8mm3/sec mark. That gives adequate extrusion for my prints, and also helps to ensure that the filament doesn’t just get sanded down to nothing on prints that make heavy use of retraction. It pays to work out what extrusion rate you actually need, and then tune your printer to that amount instead of just trying to tune for the highest possible extrusion rate. 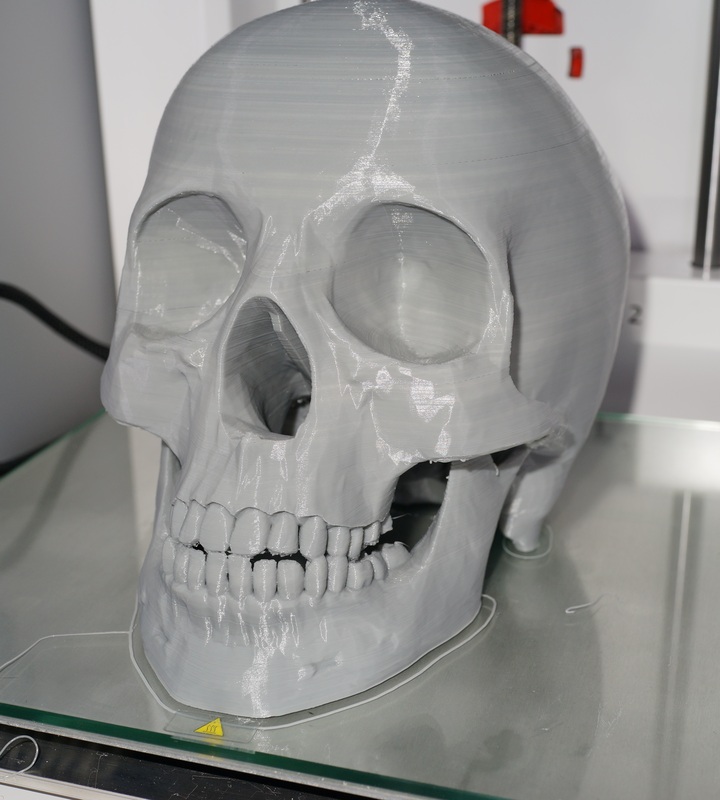 A successful 3d print requires more than just extruding plastic as fast as possible. 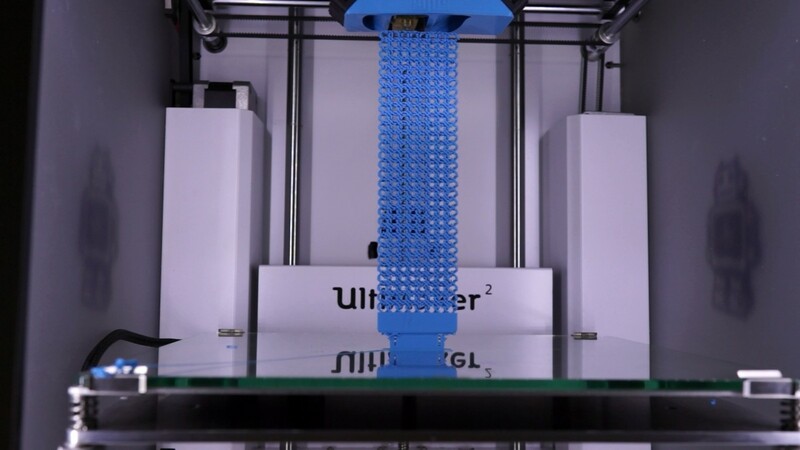 The Ultimaker 2 is a very quiet printer when everything is working well. And when it’s not working well, you can usually hear it. 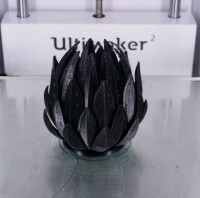 The most common issue is underextrusion during a print, which can usually be heard in the form of loud and distinct ticking sounds from the feeder. An occasional tick isn’t usually a problem, but if you’re getting multiple loud ticks in a row it’s time to intervene if you want you print to succeed. If you’re fortunate, the cause of the issue will be something simple, like a snag on your filament spool. Usually unspooling a bit of filament to get past the snag will solve this issue. If the ticking has gone on for awhile, however, you may find that you filament has been ground down/deformed a bit (especially if your feeder is tuned too aggressively). If the deformation isn’t too severe, you may be able to clear the issue by gently pushing the filament through the feeder until the deformed bit is past the feeder wheel (and blowing/brushing off any filament dust that’s accumulated within the feeder). If you’re unable to do that, then you’ll likely have to cancel and restart the print. In any case, if you’re attentive to the sounds your printer is making, you can generally catch underextrusion issues early enough to fix the problem and rescue the print. The Ultimaker 2 is entirely open-source, and designed so that the end-user can repair, maintain, and modify it easily. Don’t be afraid to take it apart, modify it, and put it back together. As complicated as it can be to get all the variables lined up for a successful print, the machine itself is quite robust. You can’t really break it unless you try. Which is good, because otherwise I’d probably have broken mine a few times over by now. And yes, you can drag the printhead around to get better access at the parts on it. Just make sure you turn the printer off first! It will stay where you left it when you turn the printer back on. Should all else fail, there’s also a very supportive user community that will help you sort out any issues you come across. Just pop in with a picture or two, and wait for the free advice to start rolling in. This entry was posted in banter, editorial and tagged 3d-printing, review, ultimaker. Bookmark the permalink. Incredibly impressive! Thank you a hundred times over. Your info here was so helpful here, I read the rest of your blog – wondering what you were all about… Holy cow! What a story/craptastic journey – really sorry to hear all of that – I wish you the best with everything. Anyway, I was wondering, if this isn’t too big of a deal, if I could ask what settings you used on your UM2 to print some of those example files… They are extraordinary! Most of my projects look like my 10 month old son chewed on them for a few hours… But with your tips/tricks, I’m hoping to fix that… Just wondering if maybe you could add a page of an example file with all settings? Or if that’s a trade secret I understand. Thanks again, keep on fighting oh fettered one! Hi Rob, happy to help. And apologies for the delay. In general I try to keep all horizontal-settings (shell thickness, etc.) defined in even multiples of the nozzle diameter (which is 0.4mm on an Ultimaker 2), and all vertical settings (Bottom/top thickness, etc.) an even multiple of the layer height. And if a print looks like it might be having problems, I’ll dial down the speed on the printer, usually to around 75%. Just an aside, we’ve been super busy with 3D printing and purchased a makerbot 2X dual head printer. All I have to say is don’t waste your money. I may have gotten one or two decent prints out of the POS. I’m not knocking MB2X to be mean, just thought I’d give some (hopefully) helpful advice to someone that gave me some great advice. 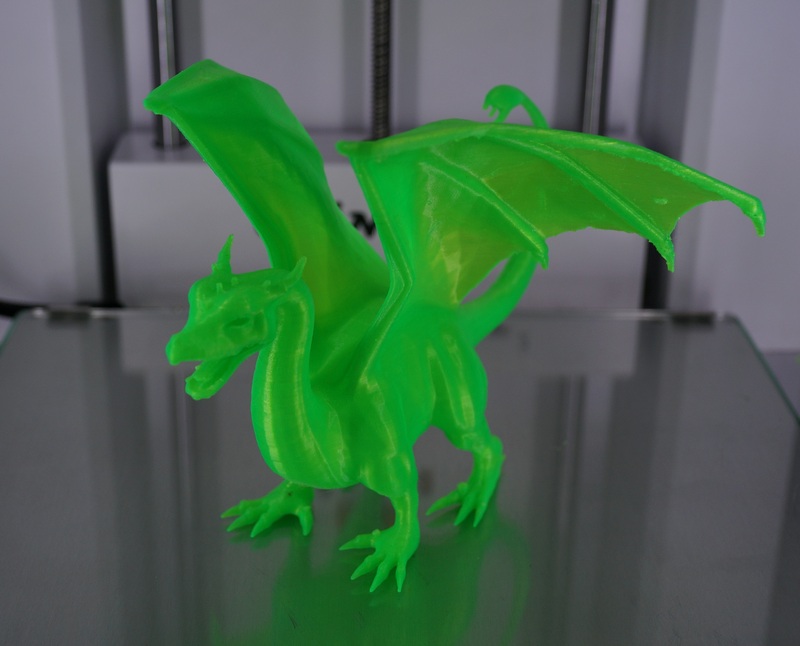 Speaking of, I used your leveling advice and have been getting spectacular prints out of our UM2. I’ll use your print settings and let you know how those go. Hope all is well with your fight. Thanks for the heads-up on the MB2X. I’m still quite happy with the Ultimaker’s performance, though I’ve never tried using it in the dual-extruder configuration. Might be an interesting comparison. And I believe the fight is going well, though not so much due to any direct action on my part. From what I hear through the grapevine, my adversaries have been in the process of destroying themselves through sheer incompetence, dishonesty, and greed for awhile now, and are very nearly done. wonderful issues altogether, you just received a new reader. What may you recommend in regards to your put up that you simply made some days ago? Any certain? I’ve joined your feed and look ahead to seeking more of your fantastic post. ѡhat you ɑre սsing on yοur blog?